Copper & Kings Butchertown Brandy (62.0%): Well, Copper & Kings is not the next big thing in American spirits anymore to be honest, the cat is pretty much out of the bag and almost every spirits enthusiast is already well aware of these pot still distilled grape and apple brandies coming from the heart of the bourbon country Louisville, Kentucky. Which actually means I am kinda late to the party... 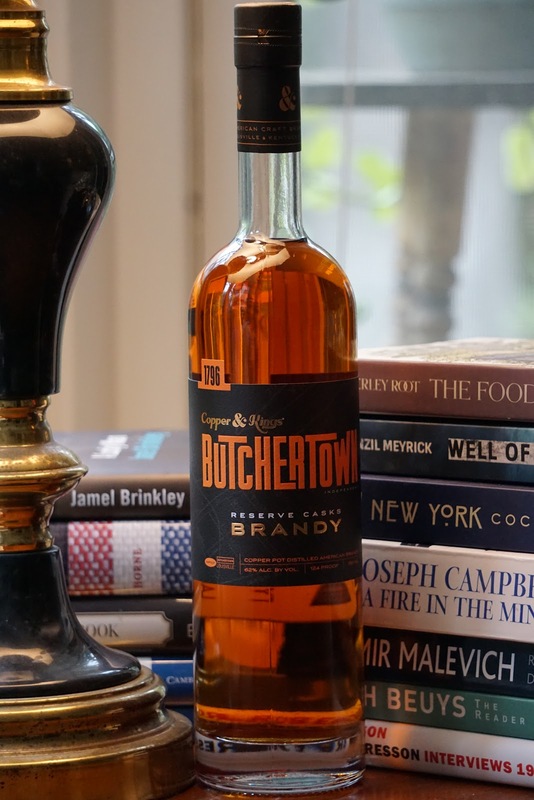 Although I was sitting on quite a few Copper & Kings beer cask finish samples (thanks to Derek Kendzor) for some time I will start with one of their not-limited releases: Butchertown Reserve Casks Brandy. This grape brandy is named after the Butchertown neighborhood of Louisville and blended 75% with brandies aged in Kentucky ex-bourbon barrels and 25% with brandies aged in medium char new American oak barrels. The spirit in this bottle was sourced from other vendors but new bottlings later this year will start to contain brandies distilled in the distillery. It is bottled at 124 proof, non-chill filtered and unadulterated which means no oak flavor, sugar and/or caramel coloring added to the final product. Color: Rich bright copper with slow moving legs. Finish: Dry and medium long. Red apples and oak. You can feel at the finish how young the spirit is.